What is the recommendations on using the Hobie righting bag with the Bravo, i.e. where and how do you rig it. I am too old and too light to right the Bravo when it tips. Any wisdom or suggestions would be appreciated. Hi..... I had the same trouble. I couldn't right the boat for the life of me. I am going to look for a rope ladder that I can maybe hook up somehow. I think the ladder is a good idea. I am 67 (175lbs) and practiced righting the boat during bathtub calm conditions. The issue is climbing onto the bottom hull. You can't because the deck is where your head needs to be when hoisting yourself out of the water. I found it necessary to climb vertically, like the old rope in gym class, until I could can stand on the bottom hull. I got it done rather easily once I was up there.... but in a blow? Anyone that has tried a rope ladder? ...or any other idea, I'd be glad to hear it. Here is an idea I drew up for this very thing. I have cracked rib at the moment and grimaced through righting my new Bravo and knew I should develop an idea. Here is my rough idea, unrefined, but perhaps this could spark some other ideas or a refinement. Let me know! 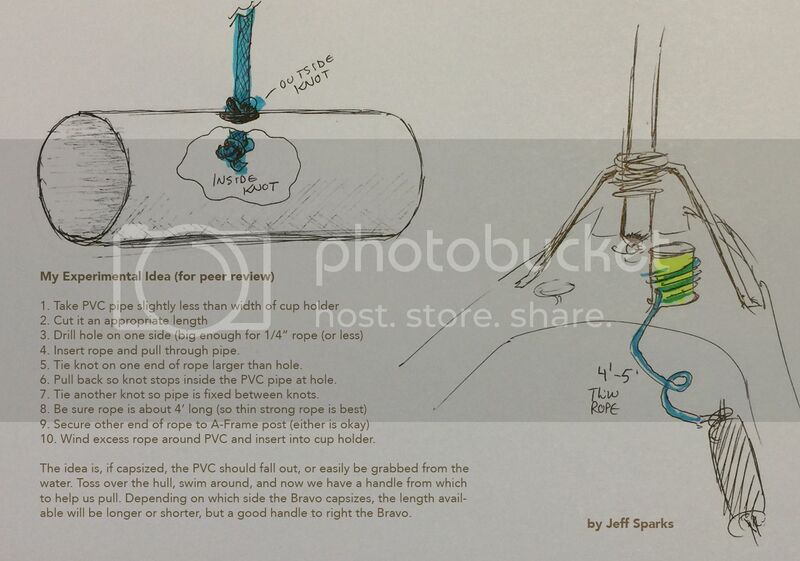 - Use thinner PVC pipe (1' x 1"), no drilling, pull rope through PVC and tie on rope, then wind around PVC and velcro strap one to each A-Frame bars, then toss over hull. - My picture actually shows this being tied to one of the hiking straps, probably better than A-Frame.